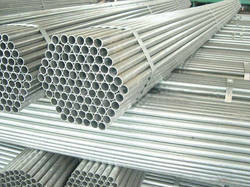 Scaffolding Pipes are premium quality building materials, highly acknowledged for their accurate dimension and sturdy structure. These quality approved building articles are aptly suitable for heavy construction purposes. We “Gujarat Industries” are actively engaged in manufacturing and supplying broad assortment of Prop Nut and Sleeve, Adjustable Base Stirrup Head Jack, Joint Pin, Wedge Clip, Single Clip, Ledger Blade, etc. Incorporated in the year 2005 at Ahmedabad (Gujarat, India), we are backed by advanced infrastructural base that is equipped with all the requisite amenities. The infrastructural base is segregated into various units such as Procurement, Production, Quality Control, Warehousing & Packaging, Sales & Marketing, Transportation & Logistic, etc. All these units are operated under the administration of dexterous professionals. Besides, our production unit is outfitted with advanced machinery, tools and equipment in order to manufacture highly reliable products. Owing to our ethical business policies, punctual delivery, competitive price structure and client-centric approach, we have been able to carve out niche in this domain.